For one jacket designed to take you from winter to summer and back again, look no further than the Apex Bionic 2 Jacket. Because it's a softshell, it's lightweight, quick drying, and super breathable, so it keeps moisture off your layers even when you start to sweat. A water-repellent DWR finish and WindWall® technology make this regular-fit jacket essentially water and windproof. The Apex Bionic 2 Jacket is perfect for any activity in any season where you may need a little extra warmth. This jacket is very nice. I'm glad I bought it. It is a softshell material. It is said to be windproof and water resistant - I haven't tested those. After years my favorite jacket finally started to wear out. I decided it was time to order another apex bionic jacket but was very disappointed when it arrived. They have updated it to be longer which would be ok but they made the waist so narrow that it fits only a light weight shirt under it and just barely at that. Forget a sweater. I'm not a large person 5' and 120 pounds but the medium fits me like the small used to. 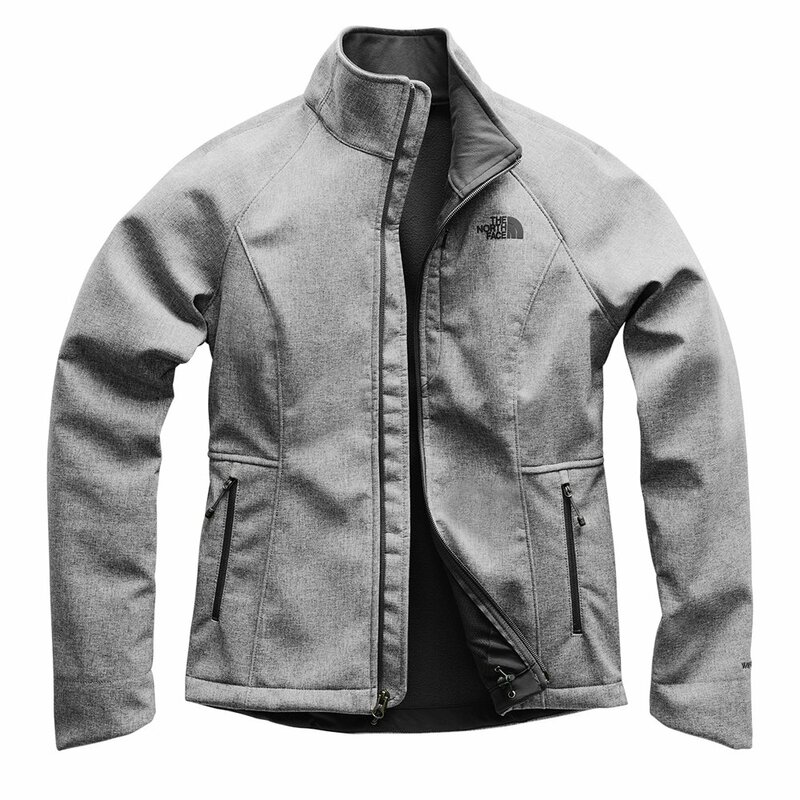 North Face I get the wanting to look good on but it still needs to be particle to wear. Great coat for fall and spring weather. Fits comfortably and made well. Bought this jacket as a spring/fall jacket for days when a sweatshirt isn't enough but not cold enough for a full coat. Its very wind resistant and holds up well in the rain. It's very stiff at first but it gets better as you wear it more. Sizing does run a bit small in the torso but sleeve length is good. It also has a nicely soft lining. The color is exactly as it looks online, hard to describe but similar to a dusty purple. Would definitely recommend, in fact i might buy another in a different color! It's been years since I bought a new North Face. While the quality is still superior, this size of this jacket is awkward on me. The jacket fits just right around my hips, but is too big in the rest of the jacket. Being 5'2", it's always hard finding a jacket that isn't too long, and unfortunately, this one is especially too long on my arms. That makes me feel awkward and a bit manly. Unless I missed it, I wish these jackets came in petite sizes. Good jacket though. This jacket is great for my walks to class, especially on windy days. It does restrict movement in the shoulders a little bit but other then that I love it! I like that you can wear this while hiking or with jeans and boots when going out with friends . It's stylish and comfortable. Color is great. Fit is on point to the size chart! I can wear this out and about, or on an active adventure. Love it. This jacket is very comfortable and warm. Great quality! I like the weight of this jacket. It keeps one warm in cold weather if outside for short periods of time. Seems to be wind and waterproof. Did have a little smell when it first arrived. I have one in the old design, love it. But this new design has too much room around shoulder area looks bulky on me, ended up returning it. Love the jacket! Blocks the wind. Love the fit and the feel of the jacket. Stylish and warm. I travel a lot for work to different climates. Allows me to stay reasonably warm in the cold north while not overheating when I get to the warmer area. Packs nice and doesn't wrinkle and is windproof. I absolutely love this jacket! It's flattering, comfortable and keeps me warm. I think it will be great for spring in Minnesota. I've worn it in 35 to 40 degree weather and it kept me warm enough however, I wouldn't recommend it for anything colder than that. It sheds water quite nicely and does a great job of blocking the wind. I'm 5'9" 140 lbs with a lean build and the medium was a perfect fit. I really like that the arms on this jacket are longer, too! I love this jacket! It is contoured and not "boxy" and great for Fall/Spring weather. Its ok of a jacket purchased one for me and another for my daughter. I find its is light weight, but would have prefered it had a softer shell. Its a great jacket, its not as warm as i would like. nice stylish jacket. the fleece inside is soooo cozy. I can wear this on cool fall days and in the frigid cold of winter. I even wear it on cool spring mornings.